I recently asked on my Instagram what type of posts would my readers like to see on my blog in 2017 and a few people suggested recipes. Guess what? I don't like to cook! I mean, I cook but it doesn't float my boat to do so. But I can share my quick go to meals and veganized recipes for other moms who also are not a fan of cooking. 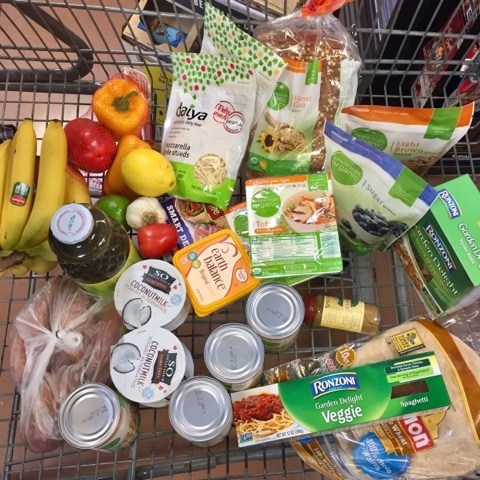 I wanted to start with a grocery haul to show what I usually pick up from the store. I shop at Costco about once a month and Kroger weekly. I keep our pantry stocked with beans, nuts, grains and pasta. I spend about $350 a month on groceries. Here is my Costco haul. 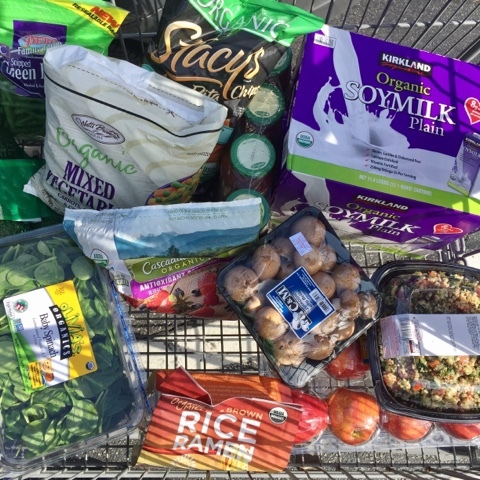 I picked up organic green beans, avocados, organic pita chips, organic mixed veggies, organic spinach, organic mixed berries, organic ramen pasta, organic spaghetti sauce, mushrooms, organic apples, organic soymilk, and quinoa salad. The total came out to about $90. I don't buy everything in this picture every time I go. The quinoa salad and ramen pasta were impulse buys. Here is my small Kroger haul. I picked up a little bit of fresh produce, juice, vegan cheese, organic sugar, organic bread, butter, smart deli (vegan deli meat), coconut milk yogurt, chickpeas, veggie pasta, organic tofu, and soft tacos. The total came out to about $60. With the exception of a few missing items, this is what I usually always buy from the store. I tend to make everything from scratch which can sometimes be a pain lol, but it is a healthier way of cooking. I am excited to share recipes and meals with you all. Be on the look out for quick recipes using these ingredients. Until next time! Looks like some great stuff! Thanks for sharing. My cart is basically just ALL produce, haha! I am meatless as well so this post was great! We have started eating a vegan diet, so this is helpful! Thanks for the info! You got a lot of goodies!